On a hot summer night in July, 20 Illinois State University students who are preparing to be teachers have gathered for class. The location: a multi-purpose room in a Salvation Army building a few blocks from the Pink Line. The subject: the culture and demographics of specific Chicago communities. Both are unexpected. But to Illinois State University education professor Robert Lee, the class represents the future of teacher education. These students are part of STEP-UP, which stands for Summer Teaching Education Partnership for Urban Preparation. Started last year, STEP-UP gives rising Illinois State juniors and seniors a four-week “pre-student teaching” placement in a CPS summer school in Little Village. The goal is to allow top teacher candidates to preview their role as future CPS teachers in relation to the district’s needs and the city’s social, cultural and educational landscape. Along the way, the STEP-UP fellows, as they are called, get a clear-eyed view of the challenges—logistical, social, and bureaucratic—that they will face in a big, urban system. The program’s coordinators believe that to clear these hurdles, teachers need to be strong advocates for their students’ welfare and understand the big-picture policy issues that have created segregated and failing schools in low-income communities of color. Most of all, the fellows will learn that successful teaching in urban schools requires deep roots in the neighborhood. STEP-UP’s fellows are mostly from Chicago’s north and west suburbs and some have little or no experience in the city’s neighborhoods. They are being taught to see beyond stereotypes and view inner-city students, schools, families and neighborhoods as sources of strength and resources rather than problems. Most of the fellows commit to do their student teaching in Little Village, a predominantly Latino neighborhood. The community roots they build during the four-week program help prepare them: They spend the time living with host families, taking Spanish classes, attending seminars on neighborhood dynamics and Chicago Public Schools policy, and working as interns for community-based organizations. A strong relationship between communities and schools is one of the five “essential supports” for school improvement identified by the Consortium for Chicago School Research at the University of Chicago. STEP-UP is drawing praise for its approach to building such relationships. “It’s fairly hard to be a teacher if you don’t really know who [the kids] are, see their strengths, and have the highest expectations for them because this is your neighborhood,” says Anne Hallett, director of Grow Your Own Teachers Illinois, which provides teacher training for parents, community activists and classroom aides who are already active in schools. Spending time in the community is not the same as being from it, Hallett adds, but she believes STEP-UP is promising nevertheless. “I like the fact that they are actually having the students live there, and get to know it first-hand,” she notes. “A strong connection with young people and their families is a really important part of being a successful urban teacher. Gloria Ladson-Billings, a professor at the University of Wisconsin at Madison who is nationally known for her work on the achievement gap and teacher training, says it’s important to have professors talk with students and help them understand their experiences in a different cultural environment. “You want people to be immersed in a community. The question is, how do they get guided through that immersion?” Ladson-Billings says. One advantage that fellows gain is first-hand experience with the difficulties that are inescapable in a large public school system. For one, logistical problems cropped up: CPS did not figure out which schools would be offering summer programs until a couple weeks before STEP-UP was slated to start, so fellows and program coordinators didn’t know where the fellows would be working. Second, since principals do not control who their summer teaching staff will be (summer school teaching is optional), it was difficult to screen teachers and talk to them about STEP-UP and its goals and approach. “We wanted somebody who preferably had been teaching for five years or more, preferably had an advanced degree. It would be great if that person was from the community or had been teaching in that school for those years,” Lee says. But it was hard to find teachers with the desired credentials. Then, during the first week of summer school, some of the STEP-UP fellows at one school were moved between classrooms because of fluctuations in enrollment and attendance. In the end, not all the cooperating teachers knew that they were going to have a STEP-UP fellow in their classroom, and some of the teachers were unfamiliar with the program and unclear about the role the fellows would play. As a result, classroom experiences varied. Gary Elementary was one of the participating schools. On a July day, fellow Kim Karnatz sits on a stool, reading out loud from the book “Tuck Everlasting.” The 12 students, who are in summer school so they can head to 7th grade in the fall, follow along with rapt attention. They discuss the book’s plot. Then Karnatz asks the students to summarize the first eight chapters. One student mentions that readers met a man in a yellow suit. Karnatz presses for more details. What did the man in the yellow suit want? Who are the members of the Tuck family? What is important about the Tuck family? The students respond eagerly, raising their hands and leaning forward in their seats. “They drank water and now they are going to live forever,” one says. The classroom teacher then chimes in to ask more questions, to instantly redirect students’ attention if they wander off point, and to remind them how impressed their teacher next year will be when they use the new words they learned. The scene in another classroom could not have been more different. Eva Lawrence, who wants to be a special education teacher, is struggling to get through a lesson with a special education class. Eight boys sit, hunched over their books, as Lawrence stands over a ninth who is softly reading aloud. From just a few feet away, his voice is almost inaudible. “We are going to write a summary about the story. Who needs paper?” Lawrence asks the class after the boy finishes reading. “I know you’re not asleep,” she says quietly to a youngster whose head is down on his desk. Most of the boys pay little attention as Lawrence tries to lead them into a discussion about the story’s details. When the time comes to write, Lawrence urges them to stay on task—“Just five sentences, guys”—but some of them giggle and fidget. One crumples his paper. Lawrence shifts course, trying to get the boys to answer a question about the various pictures in the story. “Pick one, and explain why you think it might be there,” she says. After re-explaining the question a few times and working with several boys, she moves on to a cluster of four who obviously are not paying attention to the assignment. She reads the question aloud yet again, managing to keep her frustration from showing. Later that afternoon, Lawrence and another STEP-UP fellow, Christina Moreth, discuss their experiences. Lawrence talks about her decision to study special education, and notes how the lack of resource material in Spanish makes it difficult for many Latinos, including her own relatives, to learn about disabilities and advocate for their children. (Lawrence’s younger sister has autism). She says her classroom experience has been challenging. In particular, she doesn’t understand her cooperating teacher’s strategies, like making struggling students read out loud. “They’re not getting [to hear] a model of fluent reading,” Lawrence says. Moreth’s experience has been better, but not without drawbacks. Her cooperating teacher was also unclear about Moreth’s role or how long she would be at the school. At first, she spent a lot of time observing. She did start teaching math for an hour a day after she noticed that the students couldn’t multiply double-digit numbers because they didn’t know multiplication tables. As Lawrence and Moreth talk, they’re sitting in a windowless office at Taller de Jose—“Joseph’s Workshop”—an agency that helps people who are seeking social services or other assistance to navigate the process. The pair have been working here as interns, calling clients to survey them about their experience with the agency—and getting lots of practice speaking Spanish in the process. The goal of the internships is to have STEP-UP students learn more about the community, something they also do by living there. Host families were recruited largely from local parishes and community organizations, and the students and host families were matched based on a survey and a “speed-dating” round at a mid-June orientation. The families receive a stipend to cover meal costs. 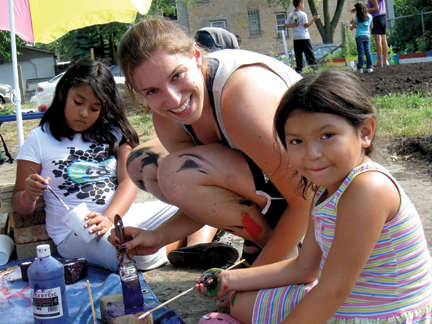 ISU also provides rented housing for student teachers—during the 2009-10 school year, 36 took part—and for faculty members who come to Little Village during the summer to redesign courses. In addition, the school is in discussions about creating a mixed-use building and community center that would include housing for even more teacher candidates. The host parents, too, see benefits. Elena Duran says hosting the STEP-UP fellows helps to change any misconceptions they might have about Latinos and Latino culture. “I feel that if they were going to live in my house, they could see that we are the same,” she says. Tonight, when Lawrence and Moreth leave Taller de Jose a little after 5 p.m., they walk back to the house of their host mother, Rafaela Raygoza. Her home is filled with paintings, sculptures, and bowls of plastic fruit. Succulent plants in green plastic pots line a windowsill. A bookshelf is filled with ceramic dancing figurines. “Está caliente (It’s hot),” Raygoza says to the two. She pours each of them an enormous glass of orange juice, then dishes out plates heaped with yellow rice, beans, beef, and vegetables. Raygoza says that it’s a good thing to bring the student teachers—whom she describes, in Spanish, as “clean, well put-together, beautiful girls” to Little Village. She hopes that hosting them will help improve the image of the neighborhood. “Out of a hundred, I would give them 100 percent,” she says in Spanish. “And they like to eat the food. I was a little bit scared, because I didn’t know what they ate, but they eat beans, and they eat rice.” Her only complaint is that the program’s busy schedule leaves little time for the three of them to watch television together, an activity that Lawrence says helps to improve her Spanish. “You’re not going to abandon me?” Raygoza asks Lawrence and Moreth. It’s near the end of the program, and Moreth reassures her that to celebrate, they will go out to a dance club or a bar. When they leave, Moreth says, they will come back to visit her. Soon it’s time for Moreth and Lawrence to leave for that night’s classes: Spanish class, preceded by a session on Response to Intervention, a state-mandated strategy that is supposed to quickly identify and assist students who need extra help and determine whether they have a learning disability. Like the class on Chicago neighborhoods, the class on RTI is part of the 75 hours of professional development the STEP-UP fellows take during the four-week program. The fellows also spend 80 hours in classrooms and 45 hours in their community-based internships, racking up 50 hours of scheduled activities each week. During tonight’s session, one thing becomes clear to the students: Policies created to improve schools can flounder by the time they filter down to the trenches. Others have questions too: How does anyone know schools are actually following the requirement? How are students in RTI transitioned from one grade level to the next? Tracking students and sharing data can easily fall through the cracks in large schools, or when teachers don’t work together collaboratively. Carmela Balice, a rising senior, mentions that a student in her class has an Individualized Education Plan, or IEP, which mandates that the child receive special education services. But it’s the last week of summer school, and the teacher has yet to see the plan. “Could they be sued for that?” Balice asks. The answer: Yes—the school could be sued, although their legal liability is unclear. Days later, STEP-UP is about to come to a close. One last seminar class is about to begin, in the attic of a large house that is the Little Village office for the Chicago Teacher Education Pipeline. Dakota Pawlicki, the program coordinator, asks them to break their usual habit of noisy, animated discussion and spend a couple of minutes quietly thinking about how the past four weeks has changed their view of teaching. “You are going to walk away from here with a few experiences that you will hold onto for the rest of your lives,” he says. Others note problems they have seen in schools, such as middle-school students who were demoralized after taking a math placement test that asked them simple arithmetic questions. Students pick up on low expectations, says one woman. Others comment on the high level of parent involvement they have witnessed—something that goes counter to the notion that low-income and working-class parents don’t care about their children’s education. Then, Pawlicki has some more words of encouragement. “The reason you have trouble being quiet is because you are all really powerful people,” he says. When they graduate, they will, if all goes according to plan, join the 24,000 teachers in Chicago Public Schools. “But right now, you are one of 20,” Pawlicki says. “You will be one of 20 of the best teachers Chicago will have ever seen.